For years, different emoji sets have been causing problems in communicating a simple emotion. Send a grimace on iOS? Get a grin everywhere else. Send a grin from a Galaxy? Get an eye-roll everywhere else. This could be changing in 2018. The fact that Emoji Fragmentation is even a term indicates an issue with our favorite little colored characters that's outstayed its welcome. Apple responded to a long-standing emoji complaint in 2016 by redesigning the 😁 Beaming Face With Smiling Eyes on iOS and macOS to better match the happy emotion expressed on other platforms. 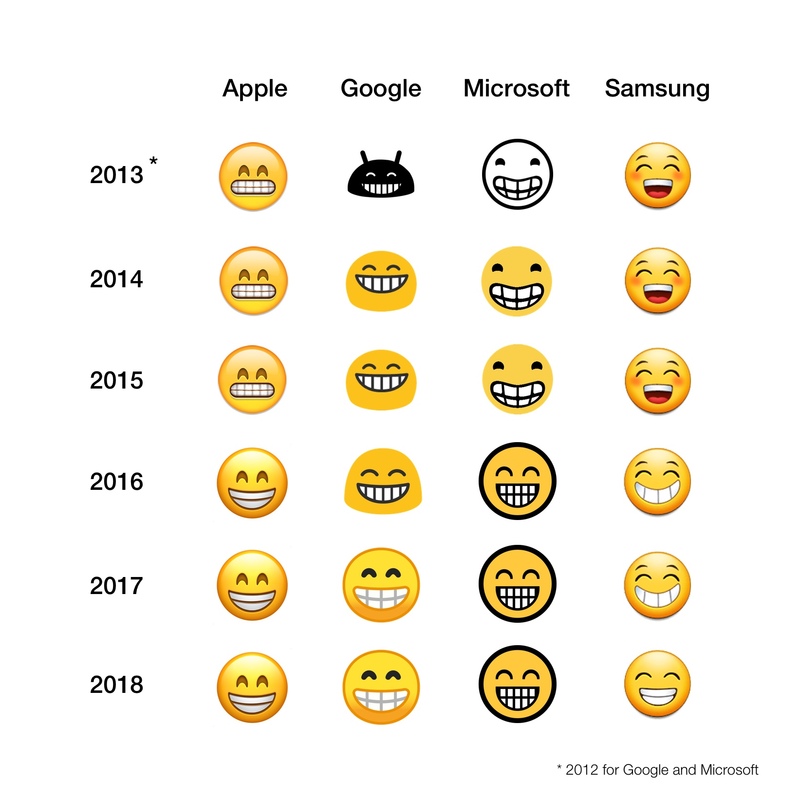 Samsung this week also released a series of emoji updates aiming to bring a number of their emojis in line with other vendors. This will be helpful for Samsung users who just want to send an emoji without (in the words of Jessica Chastain) “looking like a pervert”. While some emoji differences don't overtly change the meaning of what is being conveyed, others completely change what is attempting to be said. What we're looking at in 2018 is a convergence of many of these designs. 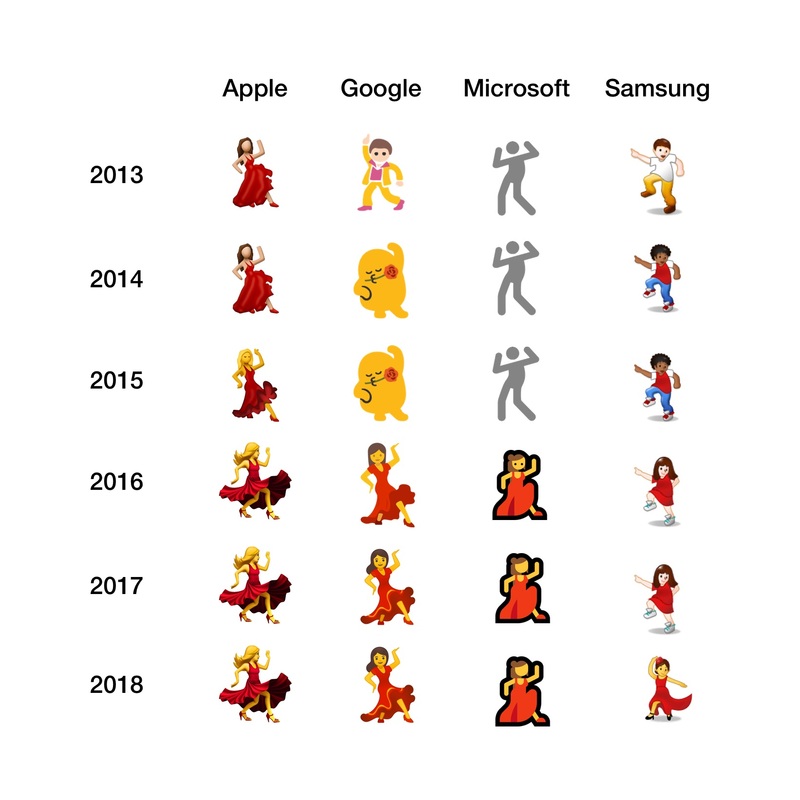 Over the past few years, the single dancing emoji that initially appeared with different genders or skin tones has morphed into a specific 💃 Woman Dancing with a red dress, one arm raised, and a leg showing more visibly than the other on most major platforms. Above: Evolution of the Dancer emoji. Image: Apple, Google, Microsoft, Samsung / Emojipedia Composite. Comparing the dancers of 2013 to the dancers of 2018 shows a clear trend in one direction: toward Apple's design choices. Not in style per-se, but in sentiment. A notable divergence in recent years is the gun emoji. In 2016, Apple released an update to iOS that switched out the gun emoji and made it appear as a toy water gun instead. At the time this meant Apple was explicitly moving the meaning of this emoji on iOS further away from other platforms. Apple made it so that iOS users would send a toy, and other platforms would see a weapon. Above: Apple changed the appearance of the pistol emoji in 2016. It's a few years later, and it appears that may well be underway. Samsung has this week updated their 🔫 Pistol to semantically (and visually) match Apple's green water pistol. Given the large combined marketshare of Apple and Samsung, does this create a tipping point where other vendors like Microsoft, Google, Facebook or Twitter feel as though they should also change their designs? If history is any guide, it seems very possible we could end the year with a full suite of water pistols replacing the traditional gun emoji. 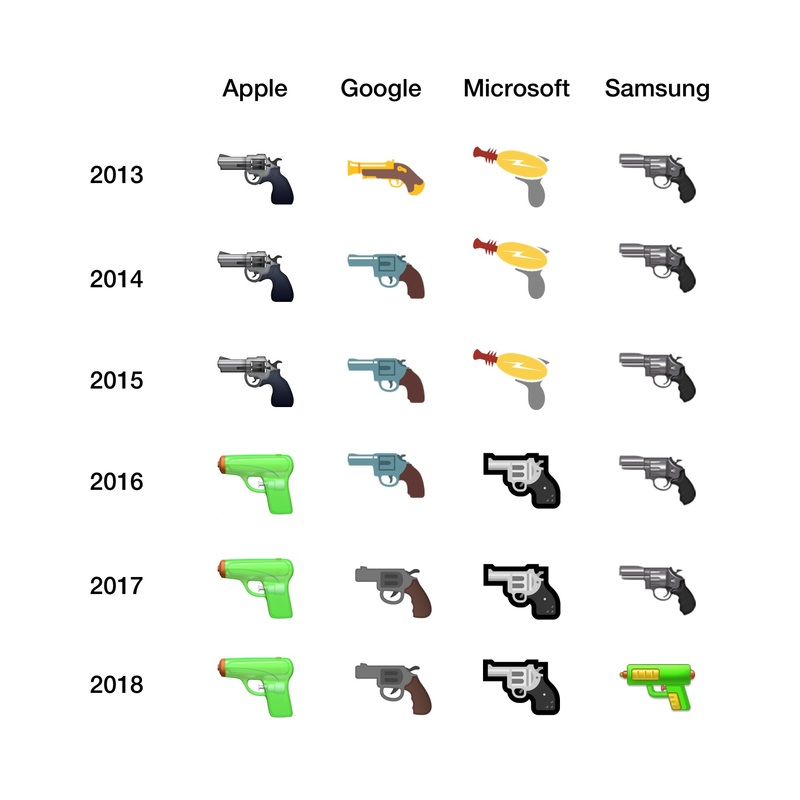 Above: A comparison of the 🔫 Pistol emoji in years 2013—2018. 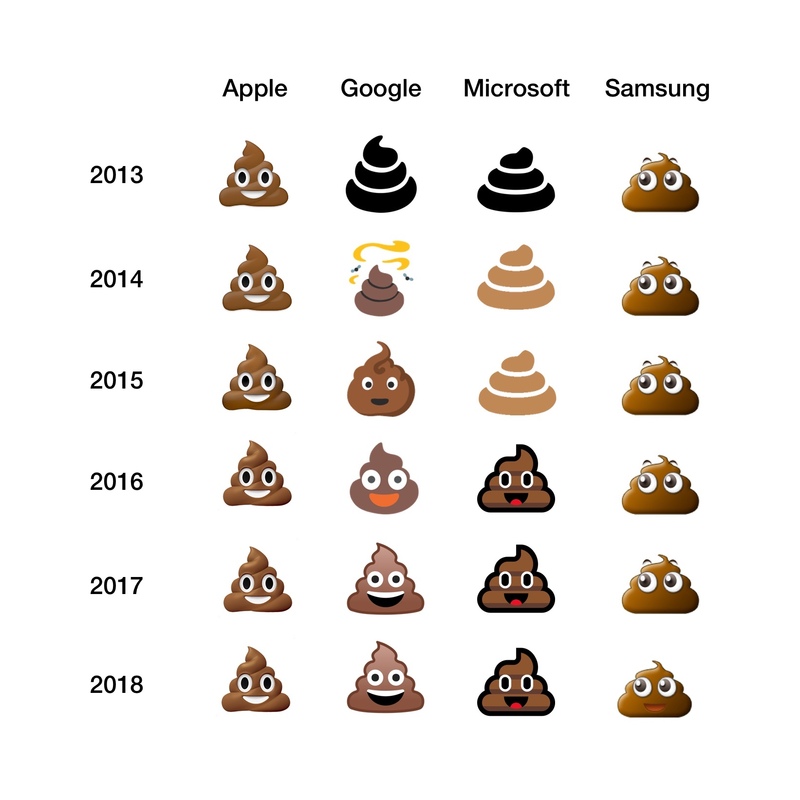 One of the most common phrases mentioned by vendors when updating emoji designs is “better compatibility with other platforms”. Generally speaking this means “better compatibility with iOS”. Some users object to this move toward matching Apple's designs, but if the end result is emoji being more helpful to more people, this seems like a win (regardless of personal preference for any specific emoji design). Phones will continue to have their own style of emoji as the years progress, but 2018 could be shaping up as the first year that major platforms include emoji designs that are emotionally compatible with one other. In my opinion, that is a good outcome for everyone. Above: Consistently smiling 💩 piles of poo. Apple's. Images: Apple, Microsoft, Samsung, Google. Emojipedia Composite. Update: Even the 🍔 burgers are converging! All platforms now display a slice of cheese directly on the patty. Something that Google saw headlines over last year. How Many Heart Emojis Are There?